The entire Havre community extends a Happy 100 Years Young birthday to Bernice Marie Ragnvald Hoveland Hardy, who was born in Havre on September 23, 1917. A dinner was given in her honor by her loving family, and we salute Mrs. Hardy on her very special day. I am humbled she loves to read this column and hope they bring fond memories to her and her family. “Hill county’s second contingent for the draft army that is the make the world safe for democracy, comprising 165 stalwart sons of this commonwealth, will leave tomorrow morning for the training camp at American Lake, Wash. The men will report at the court house this afternoon and from that hour will be under the charge of the local draft board. “Preparations for giving the boys a fitting farewell are now practically complete. This evening at the Havre hotel the women of the Catholic Altar society will serve dinner for the boys, and after a dance will be given at Lyceum hall for the soldier boys and their wives and sweethearts. A couple of weeks ago I mentioned the Grain Belt community and its school and my map of Hill County indicated there was a school in the area. I took a quick trip up north and found it, a sentinel on the prairie that had sadly seen better days but was still standing. A very large list of new American citizens was printed in the Plaindealer. There were so many, it took two days in District Court to get everyone sworn in. Most came from Great Britain, followed by Norway, Sweden, Russia, Denmark, and Mr. Manuel Couto Garcia of Spain who was living in Box Elder. 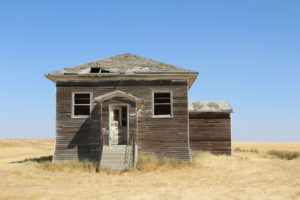 Grain Belt School north of Havre.